The Tablet issue is so-called because the value is in a "tablet" beneath the lion's head. Abasi value, three examples of position 7, two in black, one in purple. 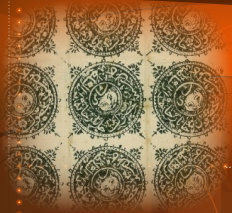 Shahi, strip of 3 positions 13, 17 and 21; pairs positions 21 and 22 (top) and 17 and 18 (on piece). Masson and Jones plated the Lion stamps in the early years of the 20th century. Since then, no-one has been able to confirm their efforts with regard to the Tablet issue as surviving multiples are extremely rare. These two pairs and a strip of three do however prove the plating of the lower left corner of the sheet. Sanar black, position 15, used on cover back. Cancelled by tear and Kabul penstrokes.